West Hartford, CT. Interior of sanctuirary, restored in 2006. Photo: courtesy of Cong. Beth Israel. In the last century, American Jews have built synagogues at a rate never seen in the world before, and in the process they have integrated the synagogue into the American landscape, and Judaism into the American cultural mainstream. 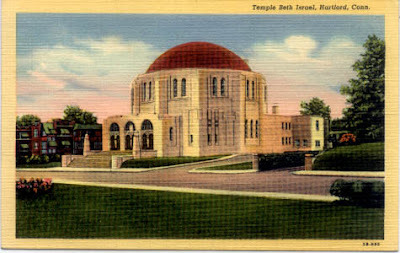 This illustrated lecture explores the evolving form and meaning of the American synagogue, especially in the 20th century, as shaped by architects and their congregational patrons. Through synagogue design, I'll trace changes in the organization of the American Jewish community and its relationship to American culture as a whole. 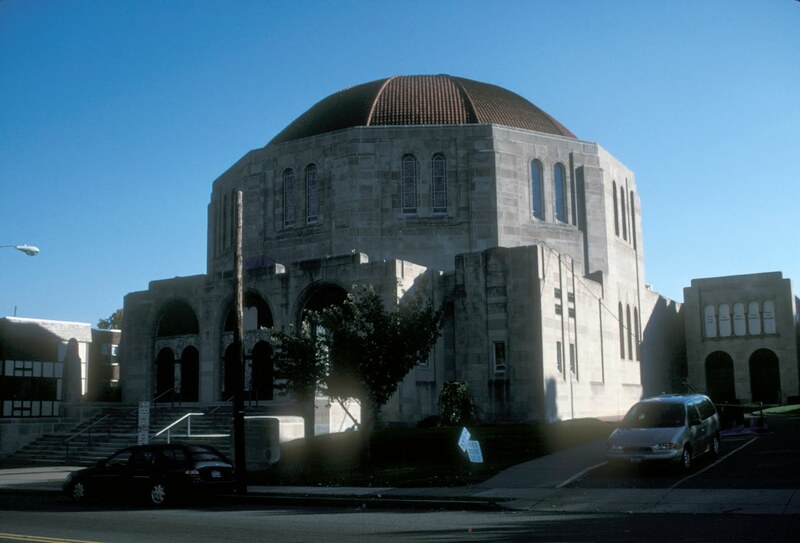 The location, size, shape, and stylistic language adopted for synagogue designs throughout the century is a reflection of the changing needs and values of American Jews. West Hartford, CT. Congregation Beth Israel. Exterior. Photo: Samuel D. Gruber (1997).Beth Israel is an apt setting for this talk. The synagogue, listed on the National Register of Historic Places was designed by Charles Greco and dedicated in 1936. The sanctuary was fully restored in 2006 - I'm looking forward to seeing it. You can read more about the congregation and building history here. It is one of the few synagogues in america entirely contructed in the 1930s. Synagogues in Hartford, West Hartford and nearby areas are significant in their won right, but also representative of broader trends. Two of my colleagues will be teaming up in conversation on Tuesday, October 25th, to discuss the synagogues of Hungary. They are celebration the publication of Rudolf Klein’s massive new book on Hungarian synagogues which is being presented in New York next week. Gavriel Rosenfeld, who was my host at Fairfield University last spring, and with whom I will be presenting at the upcoming Association of Jewish Studies meetings in December, will “interview” Klein. Both are extremely knowledgeable and good talkers, so it should be lively, interesting and informative evening. The book, which I still have not seen in its entirety, is massive - and in Hungarian, but it is packed with hundreds of photos with extensive English captions, and an impressive English "summary" that in itself is almost book length. This work is more than a book about synagogues - it is also about Jewish settlement and activity, and even what it has meant - religiously, culturally, symbolically and physically to be Jewish at different times in Hungary's history. The geographic reach is also greater than Hungary's present-day borders, including much territory once part of the Austro-Hungary. One aim of Rudi's visit to the United States is to find support for a full translation and the publication of an American edition. Readers with ideas - or funding suggestions - can contact me. will be held February 9, 2012, on the topic "Jewish Spaces, Jewish Places." Michael Meng of Clemson University, with whom I participated in a session at last year's AJS conference, will be the keynote speaker. "The conference aims to explore the plurality and diversity of Jewish spaces and places, past and present, and we are particularly interested in papers that focus on the socio-cultural processes of how Jews construct space and/or mark place. Dr. Michael Meng, Assistant Professor of History at Clemson University and author of Shattered Spaces: Encountering Jewish Ruins in Postwar Germany and Poland (Harvard University Press, forthcoming, Fall 2011), will present a keynote lecture. Professor Meng's visit is co-sponsored by the Campus Outreach Lecture Program of the United States Holocaust Memorial Museum's Center for Advanced Holocaust Studies. Papers should be 15-20 minutes long. Please send a 300-word abstract and a brief biography to: zelikovitz.centre@gmail.com. Please also indicate in your proposal if you will be requiring any audio-visual needs for your presentation. Proposals are due November 10, 2011.